Save The Not-So-Big Three...With T-Shirts! The "Save GM" t-shirt went over so well, we decided to expand the not-official Jalopnik store offerings to now include the rest of the not-so-Big Three with Save Ford and Save Chrysler t-shirts plus an exclusive Save Detroit t-shirt. In these trying times, one needs to be sporting a kitschy t-shirt and frankly, because once you're let go from your job, you'll find more time to wear them. Buy all four and be instantly transformed into Captain America! * But get 'em now below the jump before Ford, Chrysler and GM attorneys forget this is parody and try to shut us down. Operators are standing by. Support the Dirty D during its darkest hour. Now with 100% Less Kwame! 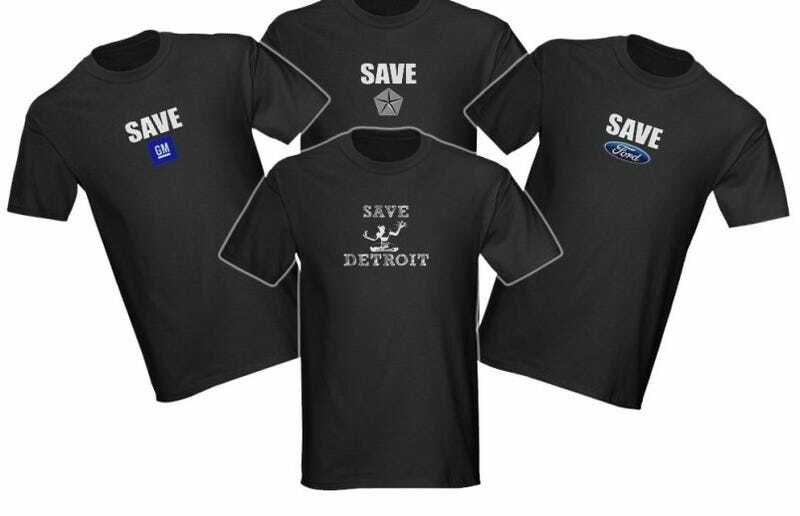 Click here to buy the SAVE DETROIT shirt. Fight for The General! This shirt just screams, "We Want Our El Camino!" Click here to buy the SAVE GM shirt. Credit card maxed out yet? Too bad - Ford needs your help ASAP! Click here to buy the SAVE FORD shirt. That bailout got a HEMI? It does now! This shirt packs 425 HP of political messaging POWER! Click here to buy the SAVE CHRYSLER shirt. *Instant transformation into Captain America not guaranteed. This statement not approved by the FDA. These T-shirts are not intended to diagnose, cure or prevent any disease; except maybe the Financiapocalypse. Freshest if eaten before date on carton. Who is John Galt? Void where prohibited.